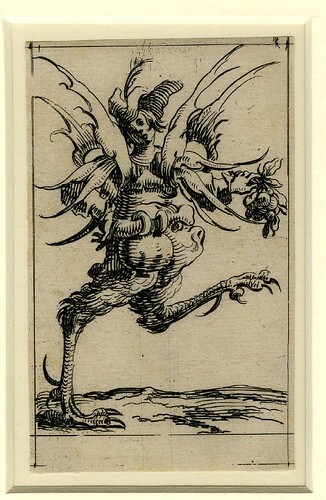 "But if it so happens ... a work ... under pain of otherwise becoming shameful or false, requires fantasy ... [and that] certain limbs or elements of a figure are altered by borrowing from other species, for example transforming into a dolphin the hinder end of a griffon or a stag ... these alterations will be excellent and the substitution, however unreal it may seem, deserves to be declared a fine invention in the genre of the monstrous. 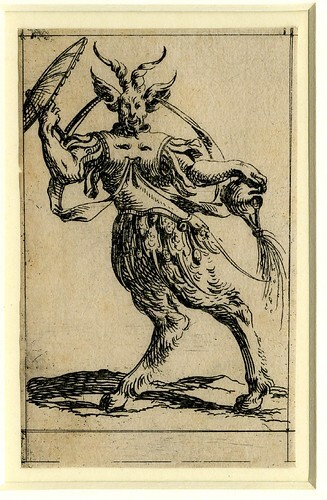 When a painter introduces into this kind of work of art chimerae and other imaginary beings in order to divert and entertain the senses and also to captivate the eyes of mortals who long to see unclassified and impossible things, he shows himself more respectful of reason than if he produced the usual figures of men or of animals." 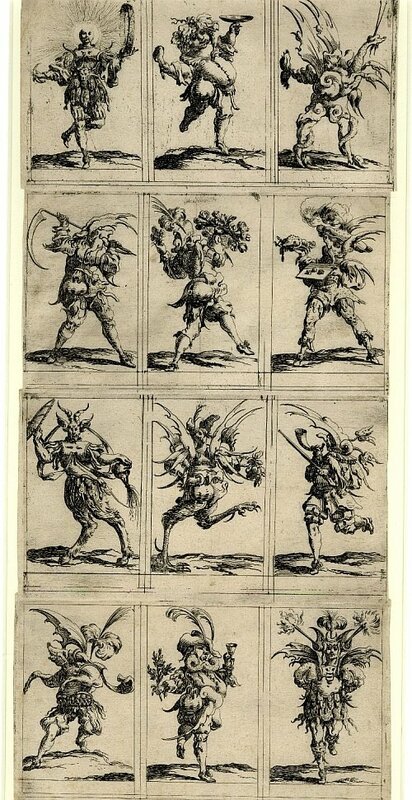 The British Museum Prints Database entry refers to this 1638 suite of prints as: "Set of twelve grotesque figures representing the twelve months of the year, printed probably from four plates in four strips of three figures each" that were "probably meant to be printed or pasted onto a folding map". 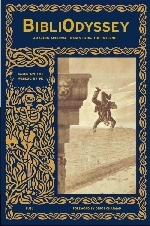 The series is by Denis Boutemie (or Denise or Daniel Boutemy aka Dionisio Bottonieri), a French jeweller, goldsmith and print engraver. Background details are sparse on the web, but his father was a goldsmith and it was through his contacts that Denis obtained work as a goldsmith in Rome for extended periods in the first few decades of the 17th century. 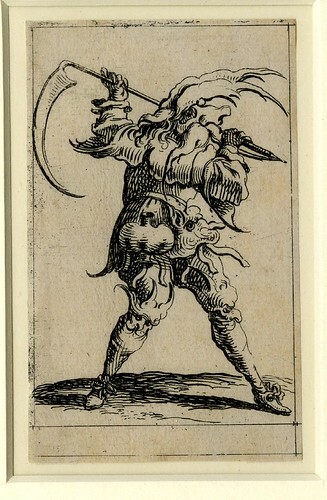 He was active as an engraver (as he was best known in France) from 1619 until after 1658. 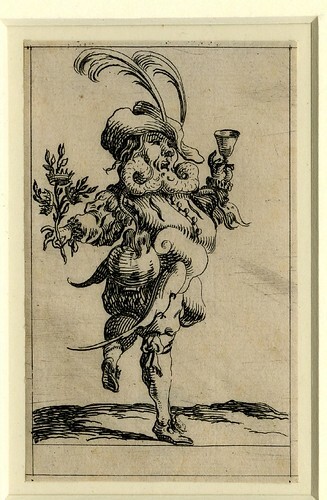 The prints have both the occasional obscure allegorical as well as obvious satirical dimension, by turns mocking dandies or presenting seasonal motifs; although the references tend to dissolve into grotesque absurdity - and happily so - in the spirit of Jacques Callot and François Desprez (see: one, two for eg. ), among others. 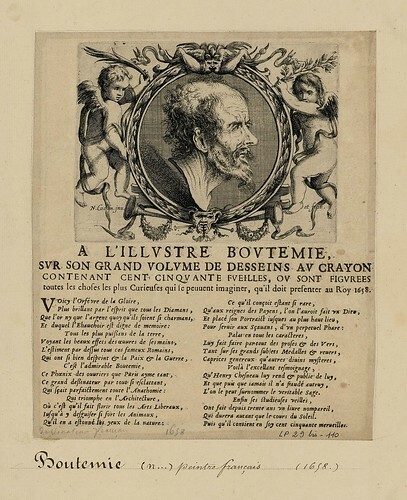 The main authority on Boutemie, sadly not online, appears to be a 1992 article in Print Quarterly (contents) by noted ornamental print scholar, Peter Fuhring¶, called 'Denise Boutemie: A Seventeenth-Century Virtuoso' (pp. 46-55). ¶ Addit: Dr Fuhring advises that he contributed to another article with Michèle Bimbenet-Privat in which Boutemie is discussed: ‘Le style « cosses de pois ». 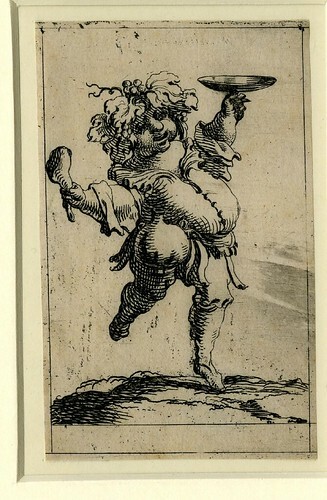 L’orfèvrerie et la gravure à Paris sous Louis XIII’, Gazette des Beaux-Arts, January 2002, pp. 1-224. 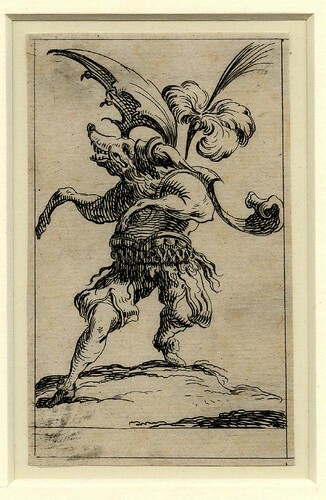 The 1658 portrait of Boutemie below - source - by Nicolas Cochin precedes a poetic dedication for an unnamed collection of Boutemie's illustrations which formed part of a large series of albums of French print artists (I think). 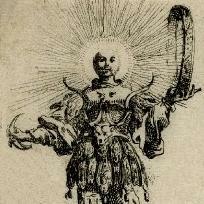 Very cool- very reminiscent of Alchemical art as well.